Obverse: Effigy of the Republic, portrayed as a sculpture. The inscription: "REPÚBLICA FEDERATIVA DO BRASIL" (Federative Republic of Brazil) at upper center. 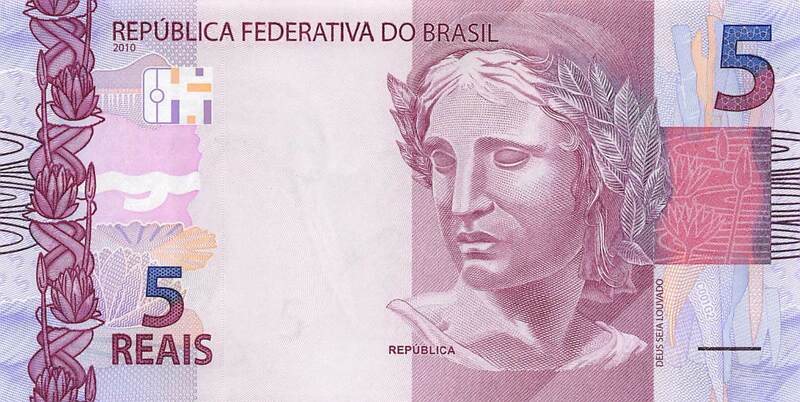 The face value of the banknote"5 REAIS" 5 REALS at bottom left and it also has a large numeral at upper right. Reverse: Picture of a Great Egret (Casmerodius albus), long-legged wading bird (Family Ardeidae). Species representative of the fauna found in the Brazilian territory. Garça bird standing in swamp at right and Great Egret in flight at right. The bank name: "BANCO CENTRAL DO BRASIL" (Central Bank of Brazil) at upper left. The face value "5" at upper left & right and in words "CINCO REAIS" (FIVE REALS) at bottom right. Watermark: Great Egret and electrotype 5. Holographic stripe. Solid security thread with demetalized 5 REAIS. Dimensions: 128 mm x 65 mm. Predominant color: Purple on multicolored underprint.